6. Chevrolet Spark | What Car? 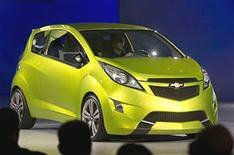 The Chevrolet Beat concept car was shown for the final time in Detroit - as GM officials confirmed that it will be put into production next year under a new name, Spark. We liked the name Beat - but Spark sounds even better. The Spark production car will be shown for the first time at the Geneva motor show in March, but early pictures suggest that it will look similar to the concept car. It will go on sale in the UK in early 2010, slotting in below the Aveo and replacing the Matiz in Chevrolet's product range. Initially it will be available as a five-door model, although a three-door car may join the range at a later date. A range-topping sporty model is also a possibility. Prices are likely to start at around 6500.